Round 2 of the hugely popular “Gamer! The first run of themed ‘splash’ colourways sold out in a weekend, so by popular demand we did a second run! I like to stay tuned in to the community online and one piece of feedback that was overwhelming was a desire to have a beadblasted finish, so we added that. I also opted for a slightly thicker but better quality carry case that should hold all your accessories. For the second run we chose 3 new games and 1 repeat from the first run. The repeat is the “Space Invader” colour. The first time around the anodizer forgot a colour, and I wanted it just right, so the 2nd run includes 3 colours of aliens! The Hero in honour of The Legend of Zelda, another game which has occupied many, many hours of my life! Check out the video and if you have ever played the game seriously you’ll be face in hands sighing, becuase we’ve all raided with a Leroy. 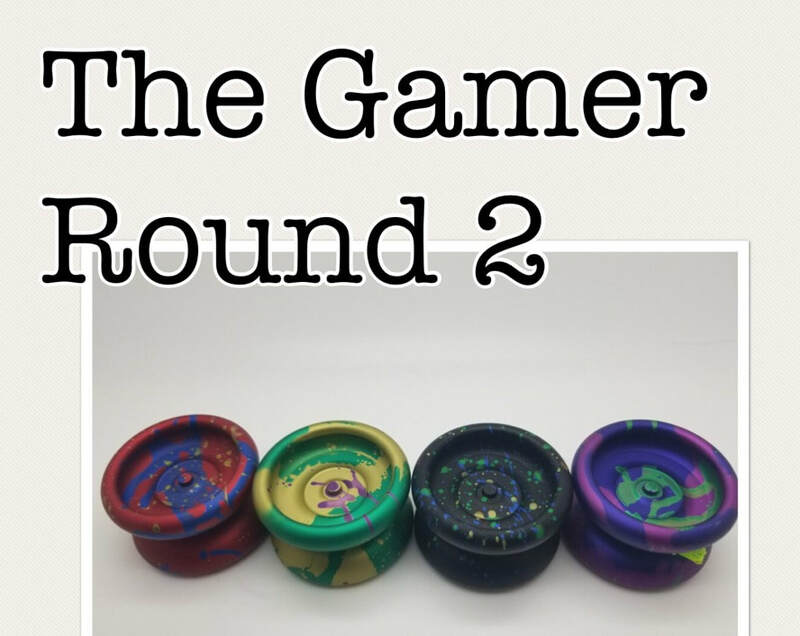 If you missed the story of the Gamer yoyo and how it came about, click here to read up. 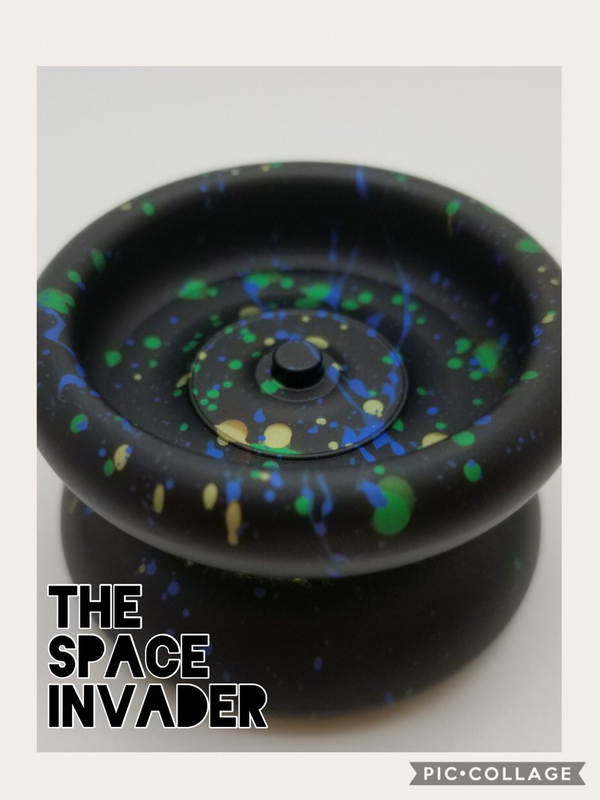 The first run actually had 500 yoyos in it, most of which were earmarked for schools and a charity project Free Hinton of Eternal throw works with. Since people seem to like their solid colours, I’ve decided to release a small quantity of what remained from the first 500 as mix/match colours. These are not bead blasted as they came from the first run. To the left is all the combos you can make with green! The Gamer has been something of a phenomenon. When J. 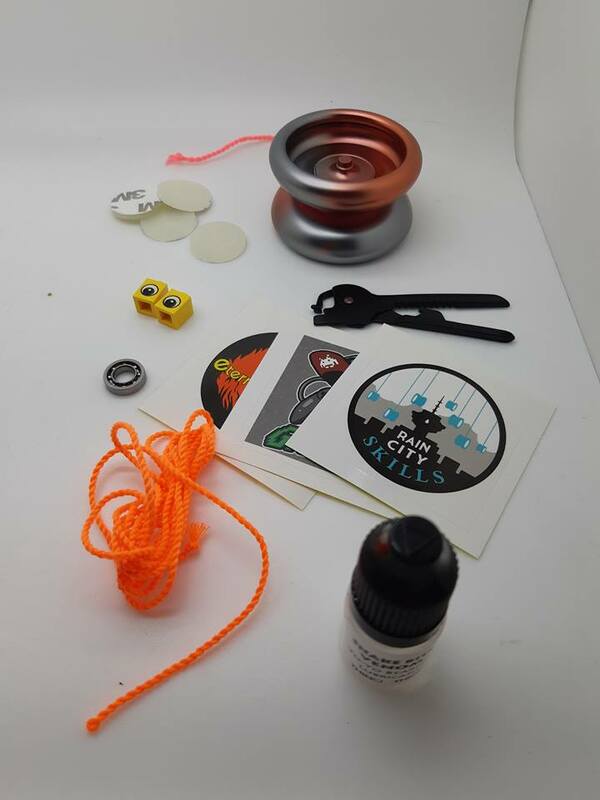 Free Hinton of Eternal Throw and I first envisioned this throw it was with the intention of making an affordable beginner yoyo that would fit well in kids hands and would be affordable enough for us to sell at contests to beginners. Free works with a charity Called “Bikers Against Child Abuse” that helps children that have been in abusive situations. He wanted yoyos that he could afford to give to this kids. I wanted them for use in the schools I work with. The design came from the intent to have a beginner yoyo, combined with a desire to pay tribute to the Tom Khun SB2, the first serious metal ball bearing yoyo. Justin Scott Larson is the brain behind the technical side of the design, having wanted to make just this yoyo for years! What ended up happening was fortunate timing. When the first run was released, slimline yoyos were in fashion and there was a demand from the yoyo community for more! We made 500 to start (that was the only way to keep the price down) and out of those 400 were solid colours earmarked for Free and I to use with kids. The other 100 were splash editions that I loaded up with extras to sell in stores. Those sold out immediatly. So we did a 2nd run of splash colours that moved almost as fast! 1 year later, 600 gamers are out in the world and demand is still there, so I bring you round 3 of the gamer! 4 new colours themed after video games, Megaman, Rampage, Pokemon, Super Mario and a fade colourway we decided to call ‘in game currency’. This throw is a passion project, not a cash grab. It’s priced at a low $44.99 to make it accessible to everyone. I want every yoyoer to have this in their case, to enjoy and to share with any beginners they see. Walk the dog, shoot the moon, or throw an unresponsive bearing in and practice your toughest combo, I guarantee your tricks will clean up fast practicing with this throw! 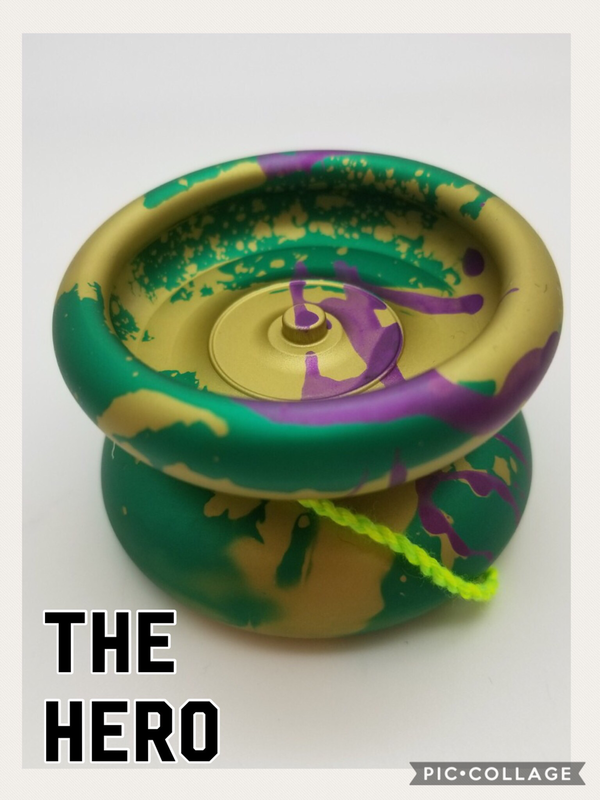 The Gamer will be available September 20th at www.returntopshop.com, www.yoyoexpert.com and www.yoyosam.com!